Eagle-eyed gamer FioraAeterna tweeted an easter egg in the Dragon Age: Inquisition codex that refers to Plants vs. Zombies, PopCap’s tower defense (and now shooter) series also published by EA. 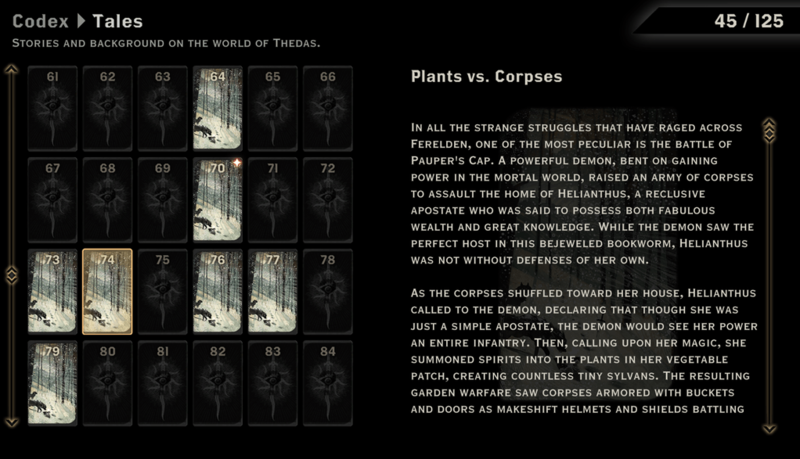 The lore text describes the Battle of Pauper’s Cap, in which the dead rose up against the home of the apostate Helianthus, who fended them off with her power to animate the plants of her vegetable garden. Helianthus and her “countless tiny sylvans” held off the undead assault on her homestead. The ensuing “garden warfare” has since become legend in Thedas, waiting to be uncovered by the inquisitor in their explorations. Dragon Age: Inquisition is a truly massive game. This means that there are hours and hours of serious content to discover, but also a wealth of little details like this that give the game character. It is available now for PlayStation, Windows, and Xbox platforms.